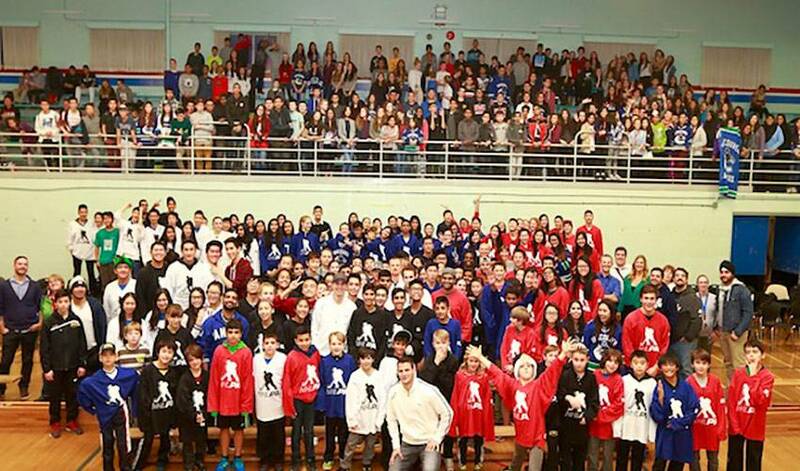 On Thursday, December 18th, the NHLPA Goals & Dreams (G&D) fund continued its multi-city 15th anniversary tour in Vancouver, British Columbia for an afternoon floor ball game featuring youths from KidSport BC and a Q&A session with NHL players Daniel Sedin, Alexander Burrows, Kevin Bieksa, and Linden Vey. The event kicked off at the Sir Winston Churchill Secondary School, where the Vancouver Canucks players were introduced one by one by special emcee, CTV Vancouver’s Perry Solkowski, to a packed gymnasium of more than 330 very excited youths. The NHLPA G&D fund then presented a donation of $25,000 worth of hockey equipment in the form of 50 complete sets of equipment, which will be divided between KidSport BC and the Sedin Family Foundation. Vancouver marks the third stop on the G&D 15 tour. G&D, the largest grassroots hockey assistance program in the world, has contributed over $22 million to grassroots hockey programs and given more than 70,000 children the opportunity to play hockey in 32 countries since being established in 1999. It has worked with many hockey assistance programs in the past, and has a longstanding relationship with KidSport BC and the Sedin Family Foundation, which made Vancouver an important stop for the tour. Following the donation, the players participated in a question and answer session, giving several lucky students the chance to interact one on one with their hockey heroes. The players and youths from KidSport BC suited up in NHLPA jerseys for a fun round of floor ball games, to wrap up the event. Once the games came to a close, youths who took part in the game as well as students in attendance were able to come up and meet the NHL players, pose for photos with them, and collect autographs - a memorable close to a great event. The next stop on the NHLPA Goals & Dreams Anniversary tour schedule is Toronto, Ontario in early 2015. If you’d like to get involved with G&D, fans have the opportunity to bid on game-worn jerseys by NHL players through a series of online auctions held in conjunction with each of the G&D 15th anniversary tour stops. In the Vancouver phase of the auction, which is now open to bidding, there’s a Daniel Sedin 2014 Olympics game-worn jersey, a Henrik Sedin 2012 All-Star game-worn jersey, and a Markus Naslund 2001 All-Star game-worn jersey. Proceeds from this auction phase will be donated back to KidSport BC and the Sedin Family Foundation, through the G&D fund.